“How do you get your protein? What about your calcium?” If you're a vegan and have ever left your house, you've probably heard these questions. They may have caused you to doubt your food choices. However, there's no need to worry. Vegetarian foods provide both of these nutrients, sometimes the same food provides both. As always, make sure to eat a wide variety of foods to ensure good health. Soy milk is one of the vegan foods that contains both protein and calcium. According to the manufacturer, one serving of a popular brand of soy milk contains 7 g of protein as well as 30 percent of the daily value of calcium. Be aware, however, that a serving of regular plain soy milk also contains 4 g of fat and 100 calories so, if you are concerned about weight gain, plan accordingly or choose “light” versions. Tofu is a source of protein, with 3 oz. of tofu containing 9 g of protein plus 2 g of fiber. Though a serving contains 5 g of fat, all but one of those fat grams is heart-healthy unsaturated fat. Also, tofu, according to the United States Dietetic Association, is versatile and can be prepared in a variety of ways, so you can eat it often without getting bored. Peanuts contain both protein and calcium. According to the USDA, a mere ounce of peanuts contains 6 g of protein and 15 mg of calcium. However, since peanuts are also high in calories, at about 166 per oz., you may want to cook with them or sprinkle them over finished dishes, such as stir-fries, instead of snacking on them. Beans are one of humanity's oldest foods, dating back more than 4,000 years, according to the Epicurious Food Dictionary. Beans and lentils are a low-calorie source of protein as well as calcium. 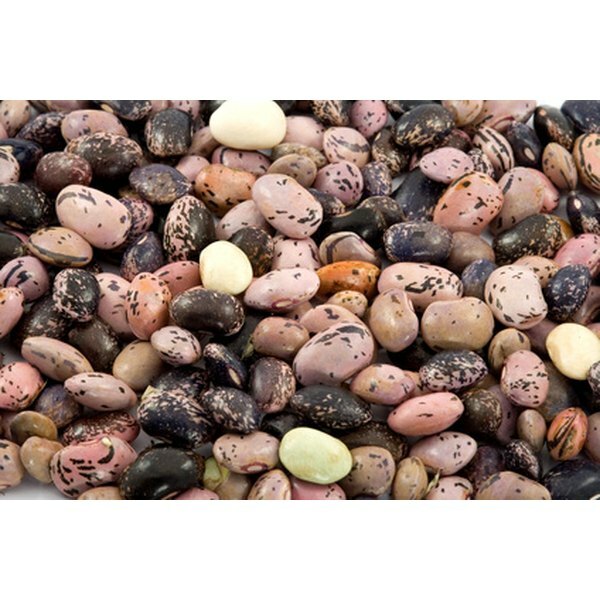 For example, according to the USDA, 1 cup of plain black beans contains 227 calories, 15 g of protein and 46 mg of calcium. Whole grains are an oft-overlooked source of low-calorie protein. According to the USDA, 1 cup of cooked brown rice contains 142 calories and 4.5 g of protein. Whole-grain breads are another good source of protein. A slice of whole-grain bread from a popular “bakery-cafe” contains 6 g of protein. Some cereals are fortified with calcium. These are good choices if you are concerned about adequate calcium intake, as they top the USDA's list of foods rich in calcium, coming in at between 263 and 1,043 mg per oz. Some vegetables provide calcium. According to the USDA, these include collard greens, which provide 178 mg per half cup; spinach, at 146 mg per half cup; and turnip greens, which provide 124 mg per half cup.